Frenchmans Flat Campground (2025'). This is just downstream of the Pyramid Reservoir dam. March 30, 2009. Success! Today President Barack Obama signed the Omnibus Public Lands Act, extending federal protection to more than 2 million acres and 86 rivers in nine states. Included in the Act are provisions to create new wilderness areas and expand existing wilderness areas in California, and to extend Wild & Scenic protection to eight rivers in California, including 7.25 miles of Piru Creek. Piru Creek is the first stream in Los Angeles County to be protected by inclusion in the National Wild & Scenic Rivers System. Approximately 4.5 miles of this reach were protected. All of the California streams protected in the legislative package were first nominated by Friends of the River and then determined eligible for federal protection by the U.S. Forest Service and U.S. Bureau of Land Management. Use this Friends of the River page to thank Representative Buck McKeon and Representative Mary Bono-Mack, two California Republicans who introduced the original bills to protect wild rivers and lands in their districts, and California’s Democratic Senators, Barbara Boxer and Dianne Feinstein who helped to secure the legislation’s passage through Congress. Few of the hundreds of thousands of people that have driven up Interstate 5's Castaic grade, thirty minutes north of downtown Los Angeles, are aware of the stunning gorges that are found along Piru Creek upstream and downstream of Pyramid Reservoir. Located just south of the intersection of the San Andreas and Garlock fault zones, the creek winds its way through land twisted and torn by the combined effects of these major faults, the related San Gabriel fault, the Pine Mountain fault, and several other smaller faults. The result is a stunning streamscape with towering cliffs, tilted strata, deep gorges, and remarkable views. Add water and the reach between Pyramid dam and Lake Piru becomes one of the most unique, isolated, and scenic one-day, road accessible, whitewater runs in the Western U.S. 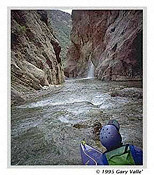 It is considered a "must do" classic by many expert whitewater kayakers. Water is the key. Water years with average,or above average, precipitation will usually produce some boatable days in February and March. But since the dam is just upstream, the release from Pyramid is the primary source of the water at the put-in. Sometimes it is necessary for boaters to make their way downstream on marginally boatable flows until side creeks add sufficient water. You don't have to be a geologist to appreciate the unique terrain of Piru Creek -- you just need to be able to gawk at the rocks, cliffs and gorges in the 2500 ft. deep canyon and say, "Wow!" Want a "before you paddle" preview? Here's a Google Earth image of Piru Creek and Google Earth KMZ file of Piru Creek that shows much of the creek from Frenchman's Flat (on the left) to Lake Piru. Zooming in, here's a image of the "Falls Gorge" section, pictured on the right. For more info see	Google Earth. 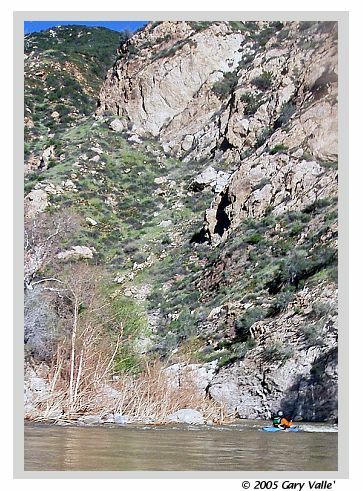 If Pyramid is releasing more than fish flow, there is difficult whitewater (and possible carries) not too far downstream from the put-in, as the river crosses the San Gabriel fault zone and turns west into the first of a series of gorges. Overall, there are many stretches of moderate class II-III water, but there are also many class IV rapids and at least one gnarly, backed class V-VI hole. This feature is found downstream of the "Falls" gorge, in an area of large Eocene era conglomerate boulders. Part of the appeal of this reach is its isolation. More than 10 miles of the creek is totally wild and cannot be accessed by road or maintained trail. Hiking in or out is a formidable task. Such wilderness is rare in Southern California. Rarer still is the special combination of wildness and natural wonder found here. We ran this reach most recently on March 9, 2005. Flow data for this date has recently been revised. As of 3/30/05, the release from Pyramid Reservoir is reported to have been 235 cfs, and the flow upstream of Lake Piru at about 335 cfs. Overall we thought this was an very good flow. Rapids had good coverage, and the more difficult sections appeared to be at a flow that would be considered in a "normal" range. Near Lake Piru there were some wide sand flats with just enough water to paddle. The lake had some areas of debris, but these were mainly a nuisance. We put on at about 8:00 am, reached Lake Piru at about 2:30 pm, and took out at the marina at about 3:20 pm. The last couple of times we've been on the lake the parking lot at the marina has been closed (and locked) at 4:00 pm. Lake Piru requires kayakers to paddle along the western shore and take out at the marina. Note: If the water "looks high" at the put-in, consider what it might be like in some of the more constricted sections. There are stories of paddlers doing horrific portages over impossible terrain to avoid difficulties created by too much water. Take a look at a topo map -- it looks like it could be very difficult to hike out from the more isolated sections of this creek. The USGS gage above Frenchman's Flat provides the stage in real time	and recent daily mean flow data for up to 730 days. While some Forest Service officials appeared to react favorably to the information presented, another referred to Piru Creek as essentially a "canal" or "a conduit for water" between two reservoirs, and went on to say that not every "wet patch" on the Forest can be considered for Wild & Scenic status! In addition, officials suggested that it was unlikely that there would be any changes in the forest plan. But (good news!) 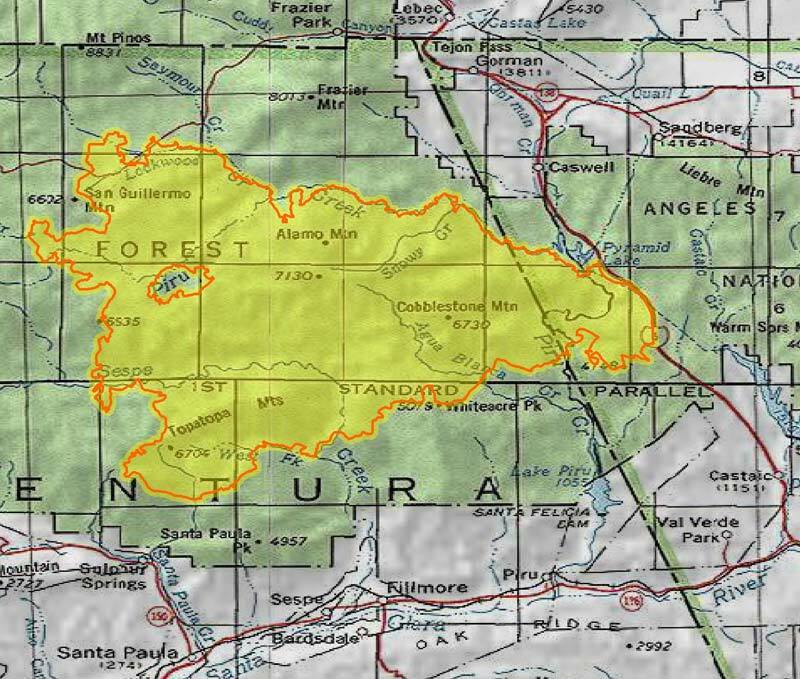 when their final management plans for the four Southern California National Forests, was released in late September 2005, the Forest Service reversed their previous finding and found that Piru Creek from Pyramid reservoir to Piru reservoir is eligible for designation as a wild and scenic river. The geologic values of this reach were found to be outstandingly remarkable, however the Forest Service held to their position that the recreational values are not outstanding. 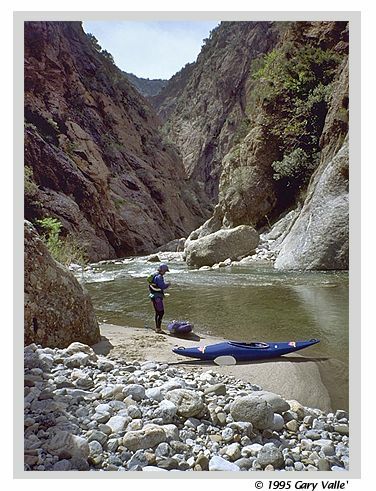 This determination is contrary to the experiences of those that have paddled, hiked, or fished Piru Creek. (A) The 3-mile segment of Piru Creek from 0.5 miles downstream of Pyramid Dam at the first bridge crossing to the boundary of the Sespe Wilderness, as a recreational river. (B) The 4.25-mile segment from the boundary of the Sespe Wilderness to the boundary between Los Angeles and Ventura Counties, as a wild river. The reach of Piru Creek downstream of the Ventura County line -- which includes spectacular "Falls Gorge" -- was not addressed in the 2009 legislation. This section is within the congressional district of Rep. Elton Gallegly, and hopefully will be extended Wild & Scenic status in future legislation. 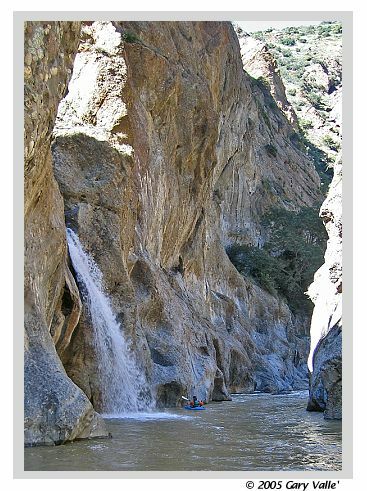 In the meantime, a large part of the reach is within the Sespe Wilderness, and is afforded the protection that the wilderness designation, and having a Wild & Scenic section upstream, provides. 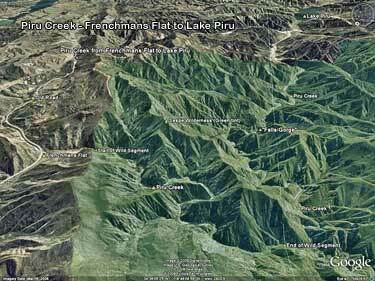 The Google Earth image of Piru Creek and Google Earth KMZ file of Piru Creek have been updated to show the Wild & Scenic segment of this reach and the Sespe Wilderness. Spectacular terrain towers above the paddler. Google Earth overview of Piru Creek. All photos are from the reach of Piru Creek between Pyramid Lake and Lake Piru. A quiescent section of the creek, where the skilled paddler can enjoy the breath-taking views of an isolated stream canyon only minutes from hectic Interstate 5. View. During the rainy season, streams cascade into the river at several points, accentuating Piru Creek's dramatic canyons and unique character. View. Towering rock walls border the stream at several points of this reach. View. Paddling into an early morning sun. View. No, it's not Idaho -- it's Piru Creek, a hidden gem that winds it way along the border of Ventura and Los Angeles counties through Los Padres and Angeles National Forests. View. The extraordinary "Falls" gorge of Piru Creek looms downstream, while Gary Gunder rummages through his dry bag for a snack. This improbable appearing narrows is one of many memorable passages on the creek. In addition to stunning scenery it has excellent class III and IV rapids, and at least one class V-VI rapid, depending on the flow. View. Pausing on an exposed rock, Gary Gunder surveys the narrow, vertical walls of the "Falls" gorge of Piru Creek, near its end. Downstream, a creek (partially obscured) free falls 80 feet into the river. View. A side creek cascades hundreds of feet down tiered sandstone walls above Piru Creek. View.